Join the many schools that have already downloaded our PencilBot Feed Me! 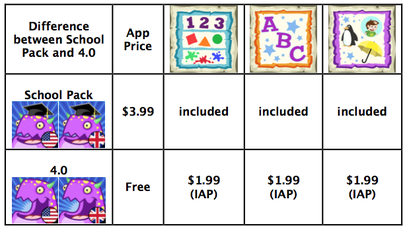 School Pack apps for their pre-K to K students. It’s perfect for back-to-school! Trying is believing – contact us today for a free promo code! Created especially for the VPP (Volume Purchase Program), the Feed Me! (US English) School Pack app covers comprehensive knowledge and concepts to meet preschooler learning and practice needs for kindergarten readiness. It consists of 3 great apps in one (2 levels per app), 34 subjects covering 40+ concepts, and 44 animated trophies to motivate kids to learn. Teachers and kids love our app with its cute little monster, hungry for knowledge. The game is easy to play and makes learning fun and challenging at the same time. It has been included as part of the curriculum for eSpark Learning and is certified and selected for the Educational App Store (EAS) Curriculum Package, for preschool through kindergarten children. It has also received great reviews from iMums (theiMum.com), Common Sense Media, Geekswithjuniors.com, and AppyMall.com, just to name a few. Our apps have no ads and no social media links. Want a language other than English? We have our Feed Me! PencilBot School Pack app available for Mexican Spanish, French, Chinese, Japanese, Korean, and Russian! These have 2 great apps in one (2 levels per app), 25 subjects covering 30+ concepts, and 31 animated trophies! Over 1,200,000 PencilBot Feed Me! iOS, Android and Windows 10 apps already downloaded! WHAT'S THE DIFFERENCE BETWEEN THE SCHOOL PACK & HOME VERSION (4.0)? See which languages are available for your device!